The Department of Theatre in the J. William Fulbright College of Arts and Sciences is excited to share Theatre for One with the community of Northwest Arkansas. 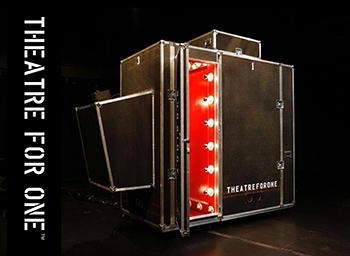 Theatre for One is a mobile state-of-the-art performance space for one actor and one audience member. Conceived by Artistic Director Christine Jones (Tony Award-winning scenic designer) and designed by LOT-EK architects, Theatre for One commissions new work created specifically for this venue's one-to-one relationship. Embracing serendipity and spontaneity, Theatre for One is presented in public spaces in which audience members are invited to engage in an intimate theatrical exchange and enter the theatre space not knowing what to expect. Actor and audience member encounter each other as strangers in this suspended space and through the course of the performance allow the divisions and distinctions that separate us to dissolve. Each piece involves one actor and one audience member and runs three to five minutes in length. Students and faculty of the department are currently participating in a week-long training intensive with Theatre for One professionals to develop original one-on-one pieces that will then be presented in several public locations through the end of April. The first Theatre for One performances will be held at Crystal Bridges Museum of American Art as part of their Slow Art Day celebration on April 14, 2018. There will also be performances at the Walton Arts Center prior to Beautiful: The Carole King Musical on April 24 and 25, and in the lobby of the Global Campus building on the Fayetteville Square as part of the Department of Theatre's ArkType Festival of New Works. All performances are free and open to the public. In addition, Christine Jones will be personally visiting Fayetteville. She will be meeting with students of the Department of Theatre and also doing a public question and answer forum at the newly renovated UA Black Box Theater in the Global Campus building on the Fayetteville Square. A Conversation with Christine Jones will begin at 5 p.m. on Tuesday, April 24, and last for approximately an hour. Come hear Jones discuss designing scenery for some of Broadway's biggest hits (Spring Awakening, Green Day's American Idiot, Harry Potter and the Cursed Child) and how she came up with the unique idea of Theatre For One. Support for Theatre For One and Christine Jones' visit is provided by the McIlroy Family Visiting Professorship in the Performing and Visual Arts. For a full schedule of Theatre For One Performances, please visit the Department of Theatre website or contact Ashley Cohea.